Losing a goal in the final seconds was the only blot on the copybook of Falkirk goalkeeper Danny Rogers. *** Danny Rogers: Top marks go to Falkirk goalkeeper for his string of vital first half saves and committed punching in the second half. He didn’t deserve to lose that goal at the end after yet another improved performance with his confidence growing and growing. At times there was good fortune to keep the ball out of his net, and at times he was indebted to his defence who put in a stellar shift, and they have a supporting role in his three-star performance. ** Blair Alston: So often a high performer, so often edged out of the Starshot rankings by more flamboyant team-mates. But Alston covered every blade of grass at easter Road yesterday and in a tireless shift laid on the goal with a shot on target – an aspect Falkirk struggled with throughout the game. 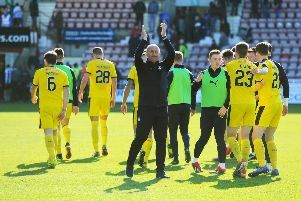 The ultimate in team player – his ability to do the dirty workin the middle and get up and down the park was typical of an excellent all round team performance from Falkirk. Deserves more recognition than he has got this season. * Lee Miller: He makes a difference, pure and simple. Miller scores the decisive goals for Falkirk and did it again on Saturday. Benched in favour of an untried teenager, Miller showed his professionalism and effect coming on for Kevin O’Hara and making the telling contribution that is becoming typical of him. 17 Baird, Vaulks; 12 Sibbald; 11 P.Grant; 10 Rogers; 8 McHugh, Kerr; 7 Muirhead, Miller; 6 Taiwo; 5 Watson; 4 Smith; 3 McCracken, Leahy; 2 Alston.